Baccarat is probably the most lavish and least understood of all casino games. If you've ever been to a land casino, and taken a stroll by the baccarat pit, you may have glimpsed gorgeous women seated about the oversized table, and both players and dealers clad in tuxedos. Perhaps you expected to see special agent James Bond himself sitting in one of the chairs. If you ventured a little closer, you may have seen enormously large bets being placed on the table in this peculiar game where the player makes absolutely zero decisions to determine the outcome. Trying to take all this in at once may have left you feeling perplexed and maybe even a bit intimidated. You may have wondered: "why would someone want to play a game where the rules and gameplay are already predetermined?" Or, "what is it about the game that attracts so many high rollers to the tables?" These quandaries are just part of the mystique that is baccarat. Baccarat is easier to learn than most people think. Only three betting options are available, and two of them offer very good chances for players. Believed to originate in Italy around the mid-nineteenth century around the same time as the invention of modern bingo, baccarat - also know as Baccarat Punto or Punto Banco, was a spin-off on the French game of vingt-et-un (21). The original rules of the game allowed a player to also act as the bank. This version is still found in some European casinos. This option caters exclusively to the high roller, because few players are willing or able to put up the bankroll required to be the house. During the 20th century, baccarat remained a fixture in most European casinos, and didn't make a strong showing in the United States until the late 1960s to early 1970s. In this period, Las Vegas was still entangled in a web of bad publicity related to various casino operators skimming profits and other scandals involving the mafia. Back then, the town was still viewed as a haven for outlaws - far from the family friendly, international tourist destination the city is today. In an attempt to 'class up' the casinos and cater to a broader audience, operators brought in the first baccarat games. They understood that baccarat was a game of style and sophistication, whose roots ran deep in the European gaming culture. They also saw it as an opportunity to bring in more high rollers. Apparently, it worked, as baccarat pits have become a fixture at every modern casino. Baccarat tables are usually found apart from the main casino floor, off in their own section known as a 'pit'. If you've ever seen one, then you have likely noticed the luxurious appointments that grace these pits, such as plush chairs, fine artwork, and the dealers all wear tuxedos. So why are these pits apart from everything and so lavish? The main reason is because they cater to the high roller. It is not unusual for players to use 1,000 credit markers (and higher) as betting units. The casino management is interested in making their elite clientele feel comfortable, so you won't find the clamouring sounds of slot machines near the pit. The other formal touches are pretty much a given. Don't feel intimidated, though. Even the low-roller can play and enjoy baccarat, as long as you understand the rules before you bet - like in any game. The object of baccarat is to hold 2 or 3 cards, which count 9, or as near to 9 as possible. The values of the cards are: face cards and tens are worth zero, aces are 1, and any other card is worth its face value. Units of 10 points are disregarded so that 9+7 count as 6, not 16. The dealer will deal out cards to both the player and dealer. Depending on the value the initial 2-card hands, a third card may be dealt to either one of the hands. Ultimately the winning hand will be the one closest to 9. When a tie arises, that is considered a push, just like in blackjack, and the bet is returned to the player. You may also bet on the tie, which is paid off at 8 to 1. In baccarat, you have the choice of betting on either the player's hand or the dealer's hand to win. 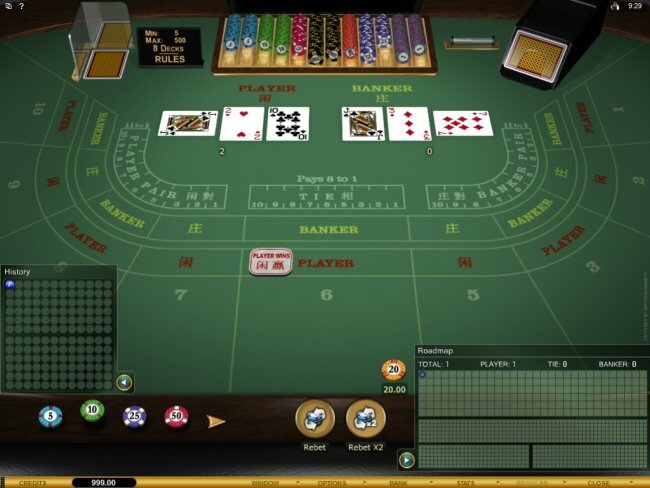 When you play baccarat at online casinos, to place a bet, you simply click either the 'Player' or 'Banker' button that corresponds to an area of the table and type of wager. The only other playing option is the 'Tie' bet, which is strongly recommend against, mainly because it carries the poorest odds of the three. An additional strategy you'll want to avoid is the martingale betting system, which has a player doubling a bet after each losing wager in hopes of leveling out. The best bet in baccarat is for the banker to win. The banker bet actually carries a positive expectation for the player, meaning the odds are in favor of the player walking away with more money in the long run. However, the casino is wise to the discrepancy, so a 5% commission is taken on all banker bets to even the advantage. Similar to sports betting, the commission is called "vigorish" or "vig" for short. Even with the 5% house take, the banker bet still offers better odds - if only slightly - for players. Baccarat is a game wholly its own that can be enjoyed by both high and low rollers alike. It provides a relaxing respite from the other games found on the casino floor, and offers a sophistication that is reminiscent of the famous casinos of Europe and Monte Carlo. The next time you're playing at a favorite gambling hall, be it online or on-land, try a few hands of this unique and interesting table game, and you may discover the allure of baccarat. Play baccarat at one of the internet's leading casino sites. Get an in-depth look at the numbers behind the cards. Which bet holds the biggest advantage? baccarat - including both regular and high limit - just for fun. Learn which bet carries the highest advantage for the house, and which ones are best for players in baccarat odds. Try your hand at a game of online baccarat - available in both standard and high limit versions. View a monthly ranking of the top 5 online casinos by payouts for table games.